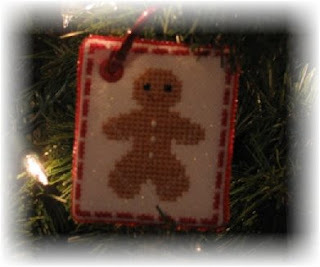 Lori stitched the Gingerbread Man Scissors Fob, finished as a cute floss tag and sent photos to share. She stitched it on 28 ct opal Jazlyn and added Mill Hill beads around the edges, for his eyes and his buttons. It turned out so cute! Thanks for sharing the photos Lori! 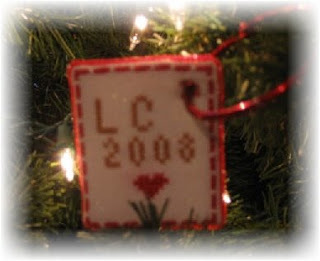 Check out Lori's blog for lots of cute finishes - she has been very busy! which blog is lori's? the link didn't work. Thanks for letting me know the link wasn't working. Blogger has been giving me fits all day - adding extra characters in the hyperlinks so they don't work, spacing not being right, autosaving not working, etc, etc. Grrrrrr! I think I have the links working now - try again! Lori, Loved your blog but especially loved your finishes! Too cute! 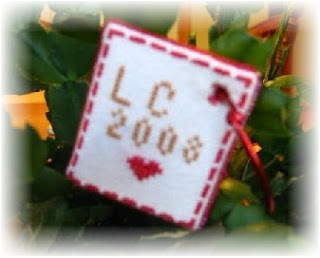 the heart, the round the square..Ok, you have given me something to strive for! thanks! Too cute!! Good job Lori! 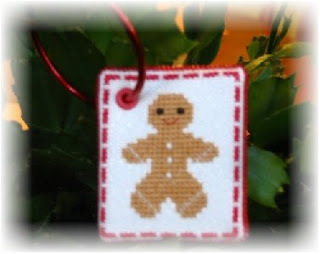 I love this little gingerbread boy! So cute! Thanks ladies! It was so much fun to do! And thanks Sharon for the nice words about my blog...you're so sweet.